The installation of sidewalks pavers and paver walkways is a simple way to add an elegant touch to the exterior of any home. The walkway is often the first thing that guests see when arriving at a property and it can pull together the aesthetic of an entire lawn or garden. 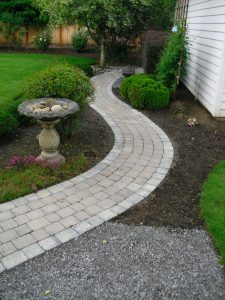 Garden sidewalks and paver walkways, made from brick or paving stones, are a popular option for homeowners looking to add both style and function to their gardens. There are plenty of styles to choose from when it comes to sidewalk pavers and walkways as well, making it easy to create a truly custom look. Using paving stones for your sidewalk or walkway is a beautiful and elegant way to enhance any home’s exterior. Paving stones can be tightly compacted to create a crisp classic look. You can have your stone walkway installed with the pavers spaced out liberally for a more relaxed look. The most intriguing thing about installing paving stones for most homeowners is that they come in such a wide range of colors and materials. From a textured cobble design to smooth natural stones, stone walkways are easy to customize to work with nearly any décor. Because there is such a wide variety of textures to choose from, some paving stones are better used in areas with heavy foot traffic, while more porous stones may be used for areas near pools and sprinklers. Sidewalk pavers or paver walkways offer wide variety when it comes to materials and looks. Small stones are ideal for creating a heavily textured look, while larger stones add balance and weight to a large outdoor space. Concrete paving stones are by far the most versatile and affordable pavers on the market. These pavers tend to come in shades of red and gray. Sandstone is more expensive but offers an asymmetrical, natural look that many homeowners find appealing. Other popular sidewalk pavers, walkways and paving stones include Yorkstone, slate, and plastic resin. Synthetic stone is often highly resistant to the elements and reasonable in price. When choosing the right sidewalk and walkway pavers to accent a home, it is important to remember the often subtle yet key differences. Not all materials are suitable for all jobs, so it is important to select stones or pavers in a size, color, and material that works for the individual home. Call Boulder Falls to get professional advice on what material should be used for your project.